756 pages | 229 B/W Illus. Quantum phase transitions (QPTs) offer wonderful examples of the radical macroscopic effects inherent in quantum physics: phase changes between different forms of matter driven by quantum rather than thermal fluctuations, typically at very low temperatures. QPTs provide new insight into outstanding problems such as high-temperature superconductivity and display fundamental aspects of quantum theory, such as strong correlations and entanglement. Over the last two decades, our understanding of QPTs has increased tremendously due to a plethora of experimental examples, powerful new numerical methods, and novel theoretical understanding of previously intractable quantum many-body problems. Understanding Quantum Phase Transitions organizes our current understanding of QPTs with an emphasis on examples from condensed matter physics. Bringing together 48 well known physicists involved with the theory and observation of QPTs, this unique work provides a thorough yet concise examination of the field. Each chapter takes readers through past discoveries right up through the latest research results, and then ends with open questions and unsolved problems. Part I treats new concepts and directions in QPTs, from dynamics through dissipation and entanglement, and includes introductory material suitable for scientists new to the field. Part II explores specific models, systems, and aspects of QPTs, including topological order, the Kondo lattice, the Jaynes-Cummings lattice, reduced dimensionality, finite-size effects and metastability, and QPTs in Bose-Einstein condensates. Part III covers experiments motivated by a deeper understanding of QPTs, including quantum dots, 2D electron systems, frustrated lattices in molecular antiferromagnets, heavy fermions, and ultracold atoms in optical lattices. Part IV presents advances in numerical methods used to study QPTs, including cluster Monte Carlo and the worm algorithm, matrix-product-state methods, and dynamical mean-field theory. Part V looks at the relevance of QPTs beyond condensed-matter physics, including their occurrence in neutron stars, the quark-gluon plasma, cavity QED systems, and string theory. Graduate students, post-doctoral researchers, and professional scientists who seek a deep knowledge of QPTs will all find this book very useful. Researchers in the field will enhance their appreciation of the incredible breadth of the subject in chapters covering material outside their specialties. 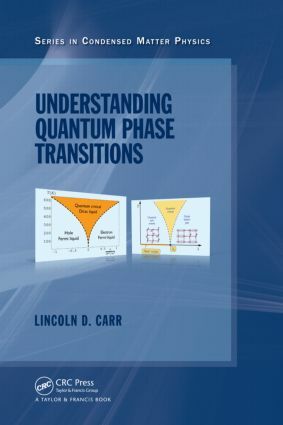 Lincoln Carr has produced an epic survey of the current state of knowledge of quantum phase transitions which nicely complements the classic textbook by Subir Sachdev … a thorough overview of methods in current use and recent results.